During a chowtut session, I enjoyed the butter squid, and was told that it was from Mama Kitchen in TTDI. Apparently, this place serves good loh shi fun and siew yuk (roast pork) wantan mee too, so I had to try it for myself. Business was pretty brisk during lunch on a weekday, but luckily, we didn’t have to wait too long. Service was quick, and our order of their famous loh shi fun, siew yuk wantan mee and fried butter squid turned up in 20 minutes. 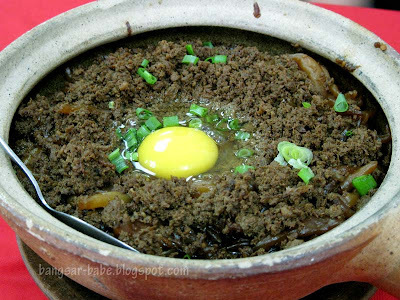 Bubbling when it arrived, the loh shi fun (RM10 – medium) was topped with minced pork, liver slices and a raw egg. The raw egg gave the gravy a richer taste and helped moisten the noodles. I thought the loh shi fun was bland and a bit on the oily side. It tasted better with a dollop of sambal and some soy sauce, but on a whole, I was disappointed. It wasn’t dreadful tasting, but it was mediocre – I didn’t think it was worth the “hoo-haa”. The siew yuk wantan mee (RM12 – medium) didn’t look appealing, and it tasted average. 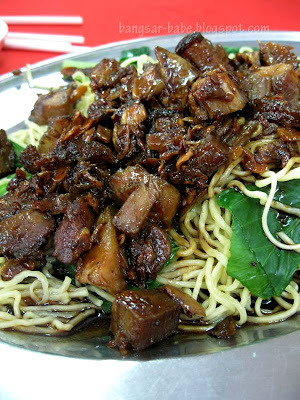 Fried with dark soy sauce and garlic chunks, the liberal sprinkle of fried shallots gave the dish a wonderful aroma. However, the siew yuk failed to impress. It was hard and tasted like leftovers, while the noodles were overcooked, resulting in a texture too soft for our liking. After two disappointing dishes, the deep fried butter squid (RM12) was the restaurant’s saving grace. The squid rings were coated with egg yolk and deep fried in butter until it turned golden brown. I loved the golden yellow strands, which looked like chicken floss but were actually bits of fried egg yolk generously sprinkled on top of the dish. The tender bits of squid, encased in the yolk-rich batter were so good, I immediately regretted not ordering a bigger portion. One hit and two misses, I would come back for the squid, and maybe try their wat tan hor and sang har meen while I’m at it. Verdict: Mediocre loh shi fun, pretty good butter squid. or just order 2 serves of butter squid. 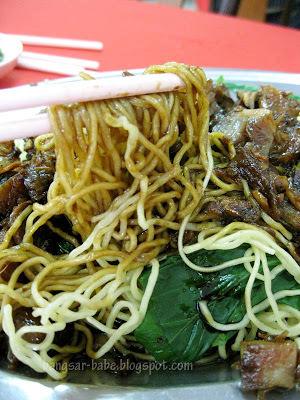 the other day i tried the claypot lou shi fun and the siew yoke mee in Chinatown Seng Kee (hope i get the name right), and the noodles were horrible. your butter squids look appealing though, with those dreamy strands of egg. 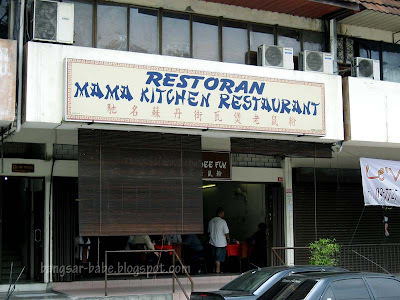 do you know that this Mama's Kitchen is opened by the daughter of Chinatown Seng Kee??? See any similarity and resemblance in their dishes??? 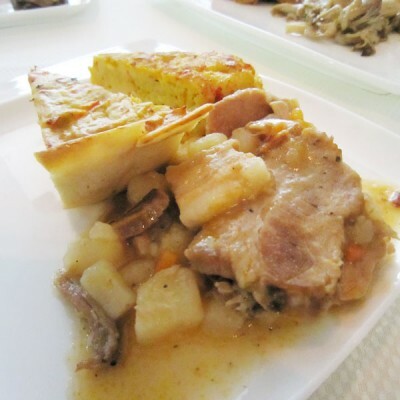 The claypot lou see fun is inconsistent.. sometimes good sometimes not up to the standard! 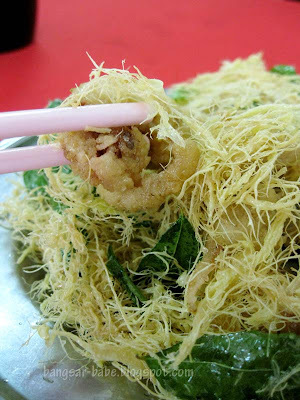 Chinatown Seng Kee – so agree w ur verdict J2kfm!! I dislike my food overly oily so will give this the miss. But the squis is promisin, guess i'll order rice to eat w it! Really that bad? I was thinking of going there for loh shi fun as I also heard it was good. Oh well. 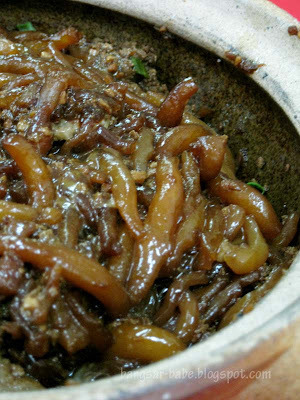 IMO, the claypot lou shi fun at Oriental Cravings in 1Utama is pretty good. Definitely worth a try. But I would order it with less "ju yau zha". Heard so much good things abt this place but pity it's so inconsistent! nomad – Yup…squid was good. Even the creamy butter squid is nice. I tried it during the Chowtut session! leo – That I didn't know! J2Kfm – Yikes…I'll stick to William's loh shi fun then. Joe – Ya lor…next time I'm ordering two big plates of squid – one dry and one creamy! My dining at this place this evening was a complete disappointment. The claypot ‘loh see fun’ was pre-cooked and I knew this because (1) it wasn’t hot when it was served to me; (2) the ‘loh see fun’ was soggy; (3) the inner wall of the claypot was clean as normally some ‘loh see fun’ would stick on the bottom wall if it was cooked with it. I confronted the lady owner who admitted the shortcoming and she blamed shortage of staff for this. Also, the ‘sui kow’ served in soup was not fresh. Despit this, I was charged in full!! I wouldn’t go back to this place anymore.